Home Blog What colour is your Christmas? Roll back the blatant commercialism of Christmas though, and underneath there is still a beautiful family festival whose evocative smells, colours and traditions pass from generation to generation and make it one of the best-loved and most celebrated holidays on the planet. Whether you bask in the religious iconography of the nativity, or simply see the festive season as an excuse to bring family and loved ones together, Christmas most certainly doesn’t need to be all about throwaway bling and extravagant spending. 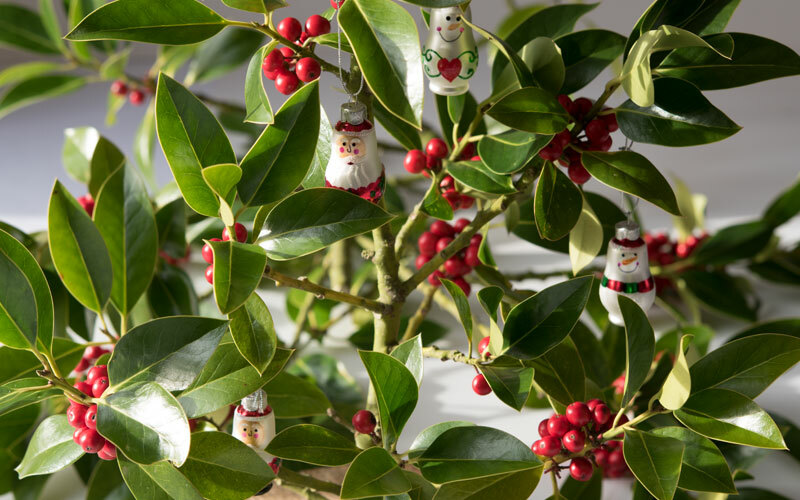 Here at Boundless Beads we love this time of year for the opportunity it gives us to create beautiful, traditional hand-made gifts and inspirational, hand-crafted decorations. This year, we have loved working on a new festive design for a beautiful, lacy-edged cuff bracelet which we’ve created in two different seasonal colour schemes. 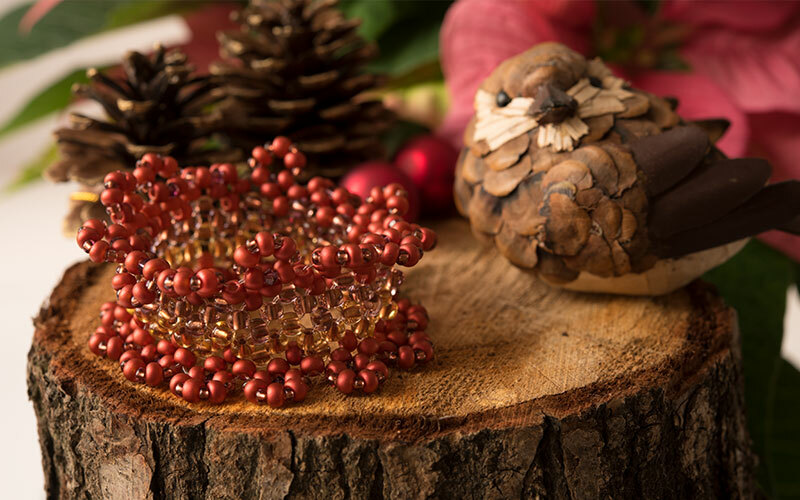 Firstly, we created the bracelet in a rich blend of traditional reds and golds (below), which showcases some of our very newest brushed metallic Preciosa Czech glass beads (we think they look just like little glistening holly berries!). For something a little more understated, but no less charming, we took inspiration from the velvety warmth of cinnamon and star anise to create a more coppery, rustic feel to the same design (below). We created our 16cm festive cuff bracelets (elasticated one-size-fits-all) using traditional Czech seed beads. We then added some Christmas sparkle with Swarovski® crystal bicones to give a really glamourous edge. If you think these gorgeous bracelets would make a perfect hand-made gift this Christmas, you can order them in kit form on our website . 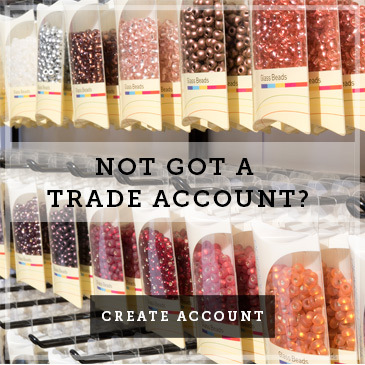 Our kits include all the materials you will need to complete the project, as well as comprehensive, easy-to-follow instructions. 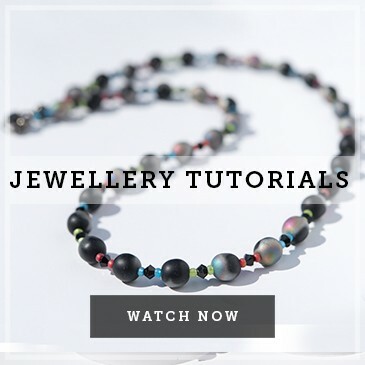 For a bit of extra help, we’ve also put together an online tutorial to guide you through each of the steps and techniques you will need to master to create your own bracelet. We hope you enjoy giving and receiving these little slices of beaded Christmas magic, and that they will be worn with love for many Christmases to come! 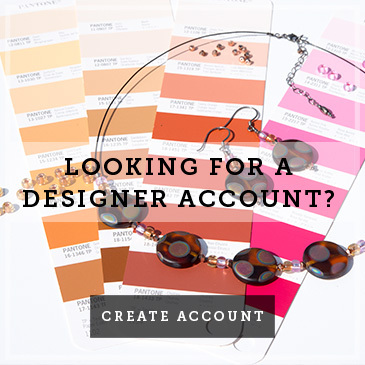 If you don’t want to follow one of our designs though, then why not have a go at creating your own hand-made jewellery, taking inspiration from the world around you? 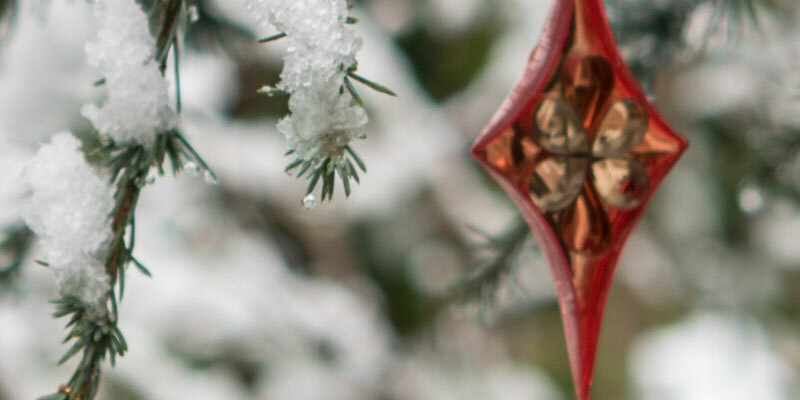 From the evocative scent of pine needles and the rich aroma of cloves and cinnamon, to the greens, golds, russets and reds of the traditional Victorian Christmas celebrations (from which we derive so many of today’s traditions), use these seasonal cornerstones to help drive your design choices. 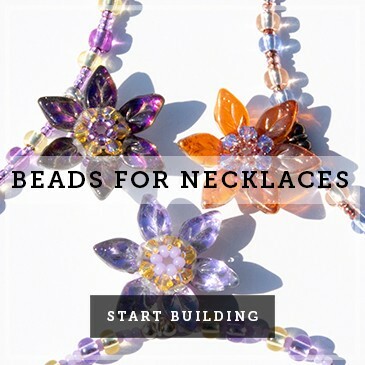 If you are stuck for ideas, have a browse through some of our beautiful feature beads and Swarovski elements to help you on your way. Be sure to narrow down your colour choice using the menu on the left of the page, and remember, the best ideas are often the simplest, so don’t over-complicate your design if you don’t need to. It’s not all about jewellery at this time of year though. Many of the Czech glass bead-makers we work with are involved in the production of delicate Christmas tree ornaments and their work is truly exquisite. 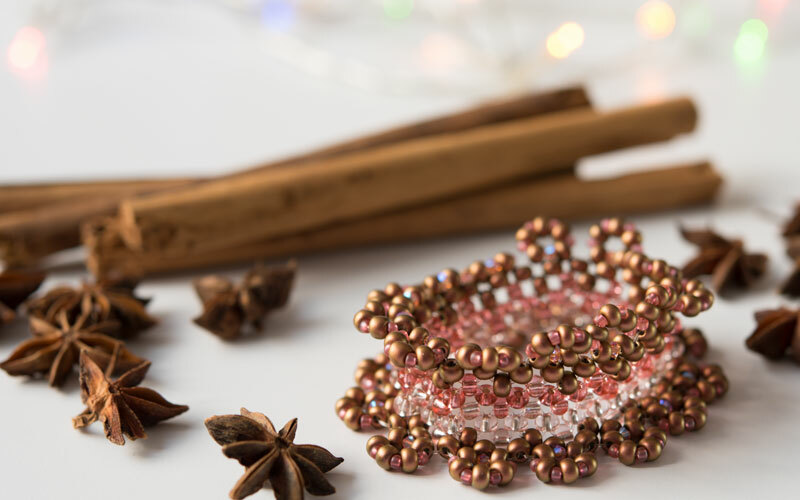 To bring some of their traditional craft into your home, and to create a very different look and feel from the mass-produced items you buy on the high street, why not experiment with your own handmade decorations and tree ornaments using Czech glass beads? Whatever colour your Christmas, we hope we have inspired you to add even the tiniest hint of unique home-made glamour to your wish list this year. 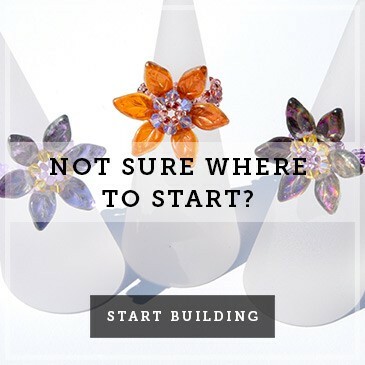 And, if hand-made Christmas jewellery and ornaments seem like a step too far, how about adding a small bag of glistening Swarovski crystals to someone’s stocking or gift hamper… who knows where the creative journey you will inspire might lead? Merry Christmas one and all! We hope your festive season will be filled with love, laughter and lots of Boundless Beads sparkle!